DW red spider pine snare drum. Wax model was made consisting of 11 separate pieces. 16 “tension rods” were fabricated in metal. 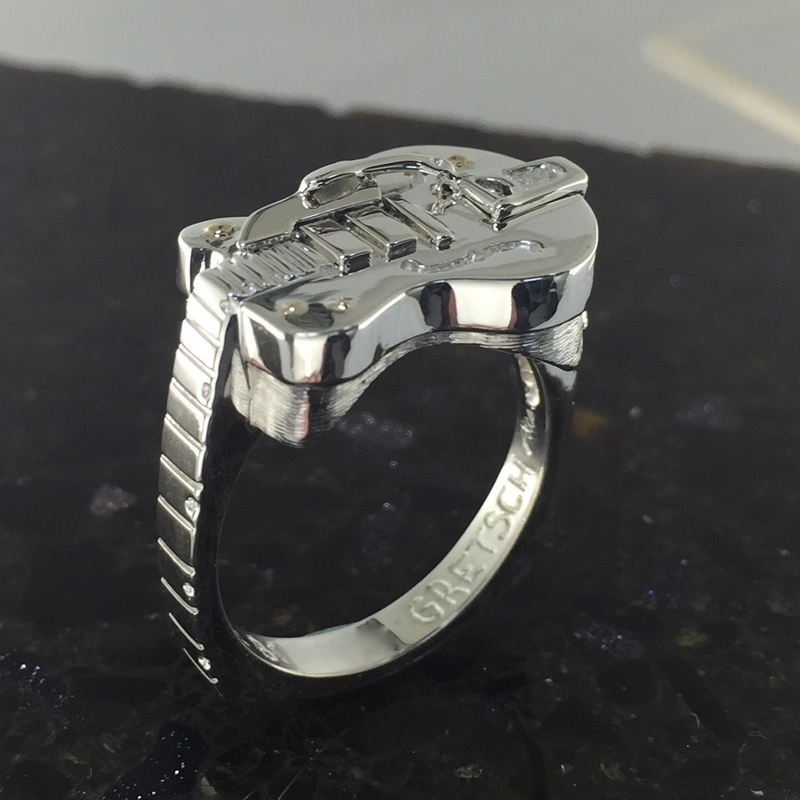 I cast the hardware in 14k (585) white gold. The shell was cast in rose gold. All of the components were sanded and polished then assembled. The shell was given a texture to give it a wood feel and to contrast the polished, hard metal parts. Holes were drilled through the rims and into the lugs. The 14k wire “tension rods” were then laser welded in place. 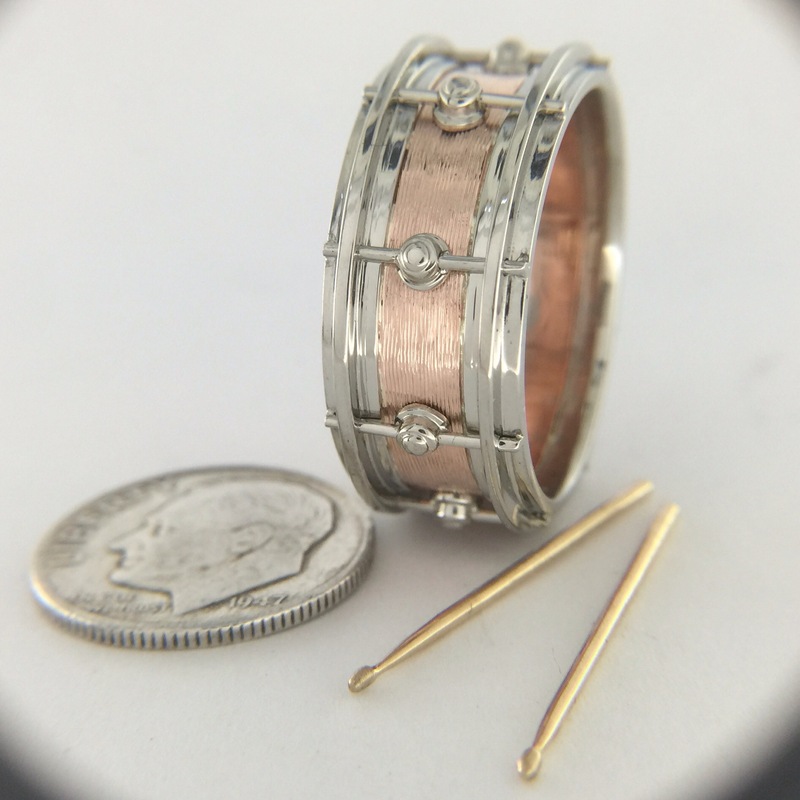 Finished snare drum wedding band. 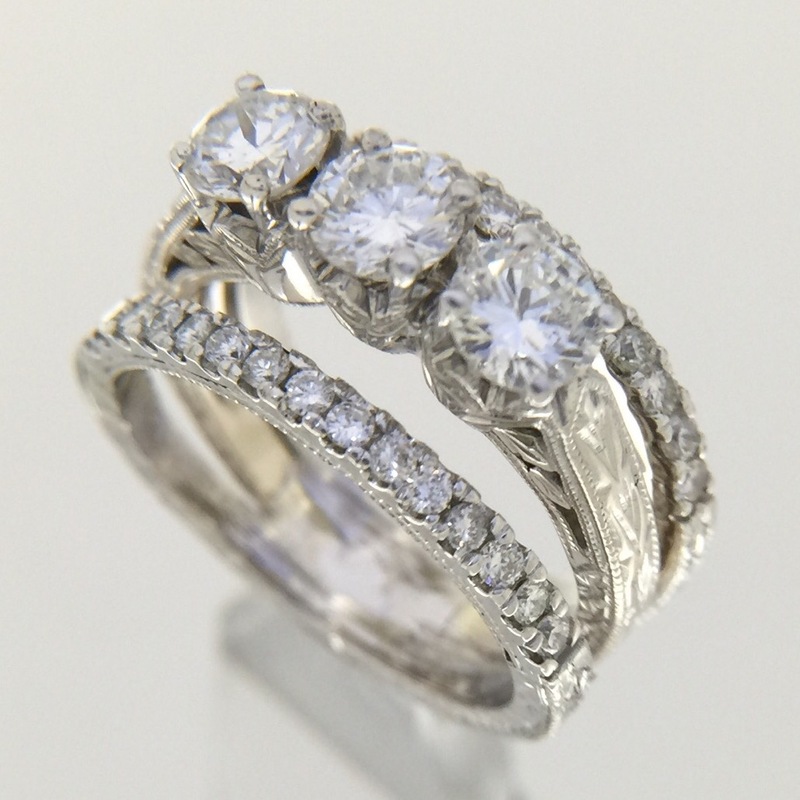 I get the honor and joy to work on and to create some very special jewelry. 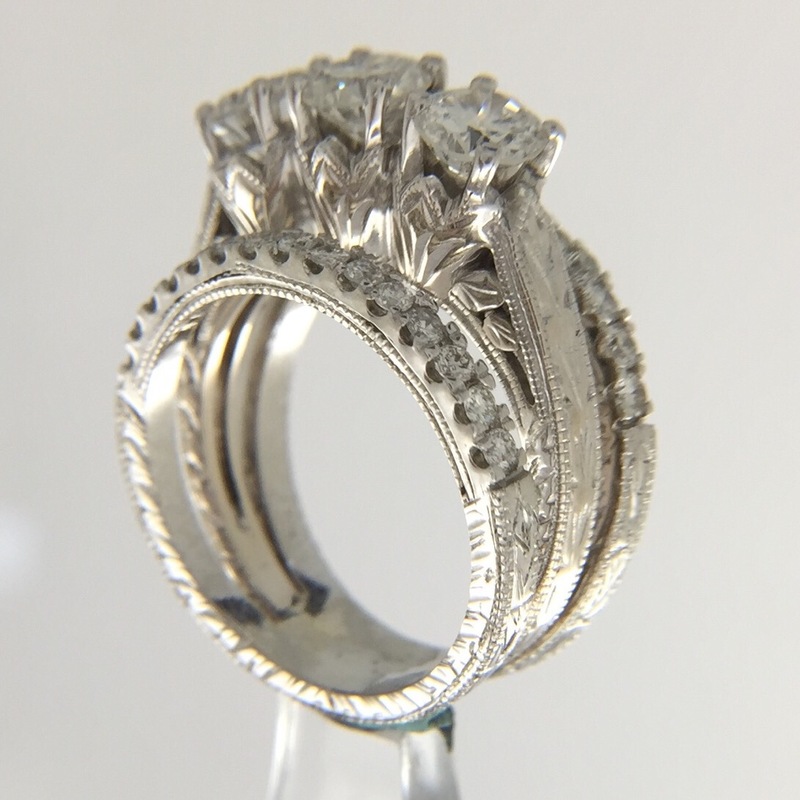 There are some pieces that seem to transcend “jewelry” and become something bigger. It is truly a blessing to work on these pieces. 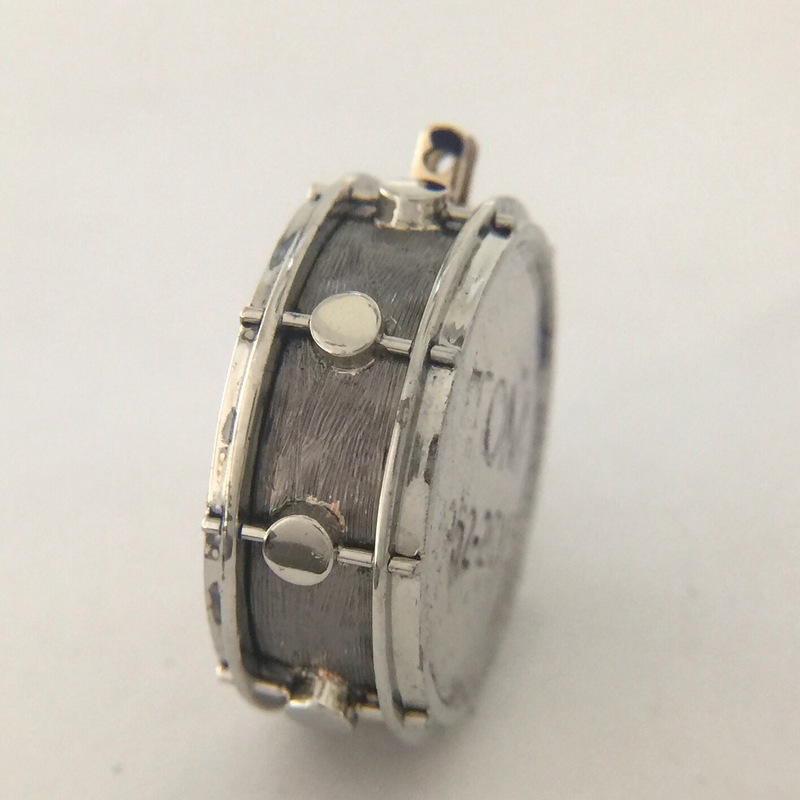 Beth literally lives across the country from me but, by chance, she had seen one of my drum rings. 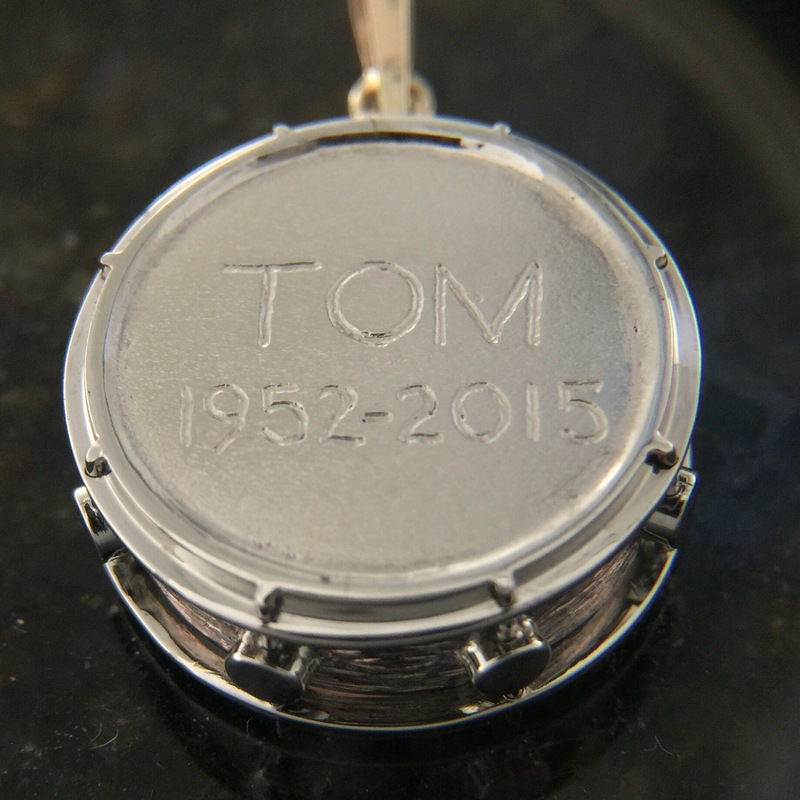 She contacted me and asked me if I could make a special pendant in tribute to her late husband, something to hold some of his ashes. We emailed back and forth bouncing ideas and thoughts about construction and all the special things that we could build into it. I am so honored to have been able to make this for Beth. 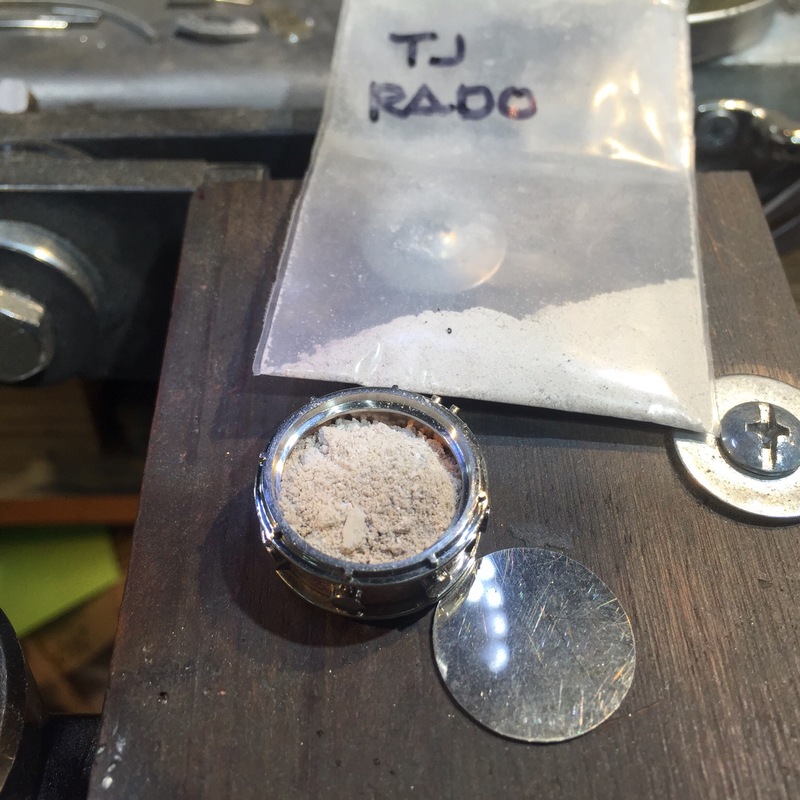 After a two month creative journey, today I finally received the drum ash urn pendant. There is quite the back story to this beauty. I will tell you that it is even more beautiful in real life than in the photos. I was inspired by two people in the creation of this incredible work of art. First, my widow sister Rena has a beautiful ash urn pendant of a turtle. Her husband Kent was a Hawaii surfer dude and it was very fitting for him. It got me thinking about what would be appropriate for Tom. Then I remembered a post by Carrie, who was Tom’s hair stylist for years. She is engaged to a drummer (who also happens to study with Tom’s drum teacher Tracy). 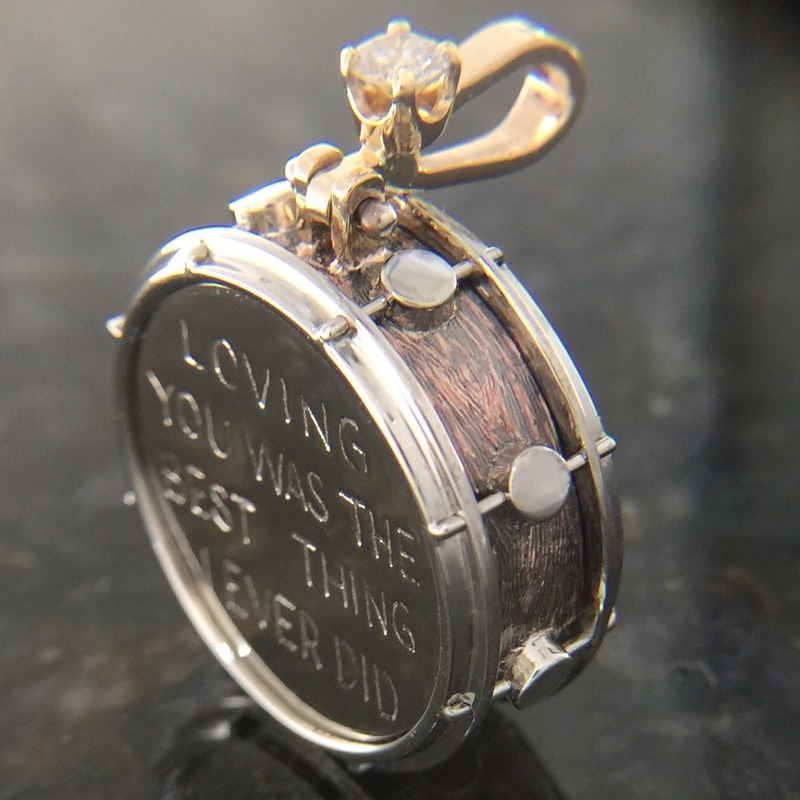 She posted about the custom drum wedding ring Steve had made. 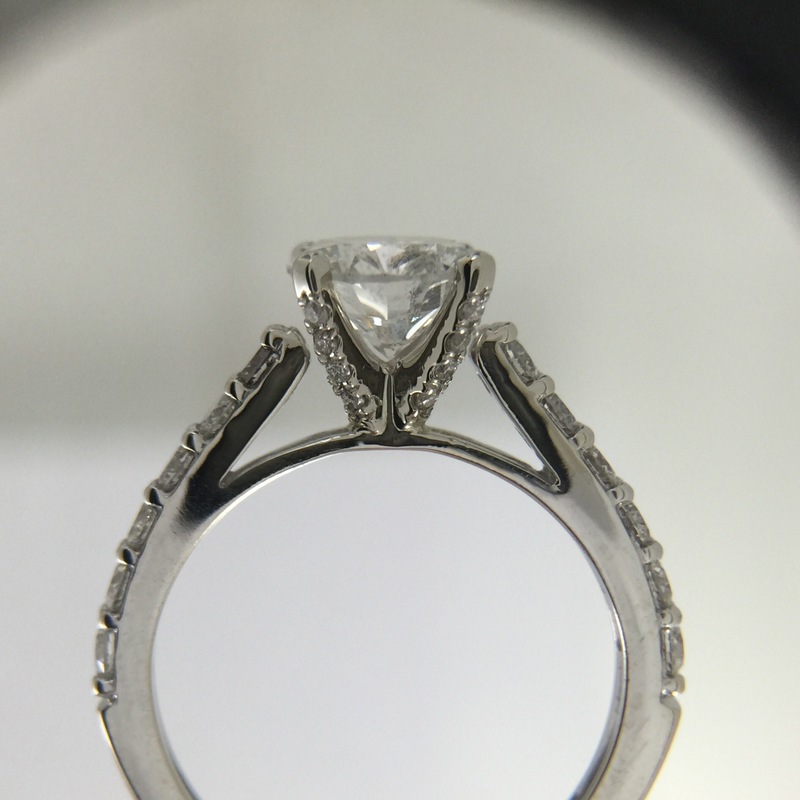 Since I could not find anything that I liked, I contacted the jeweler, and asked if he would be willing to work with me on this piece. 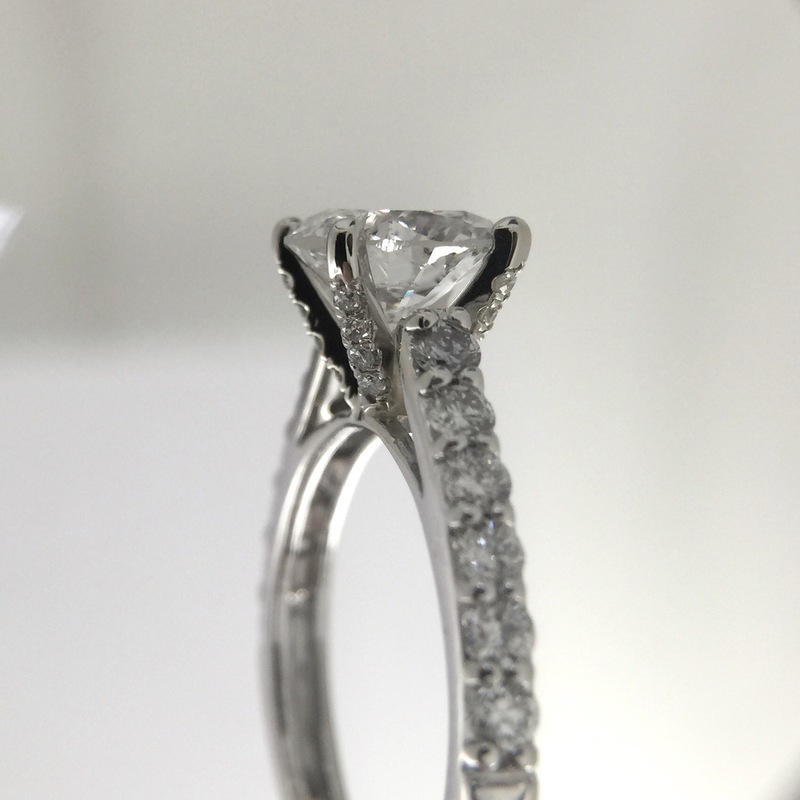 To say I am blown away by the jeweler’s creative talent and exquisite workmanship would be an understatement. The process was as rewarding as the finished piece. The first decision to be made was which drum would be the inspiration piece. 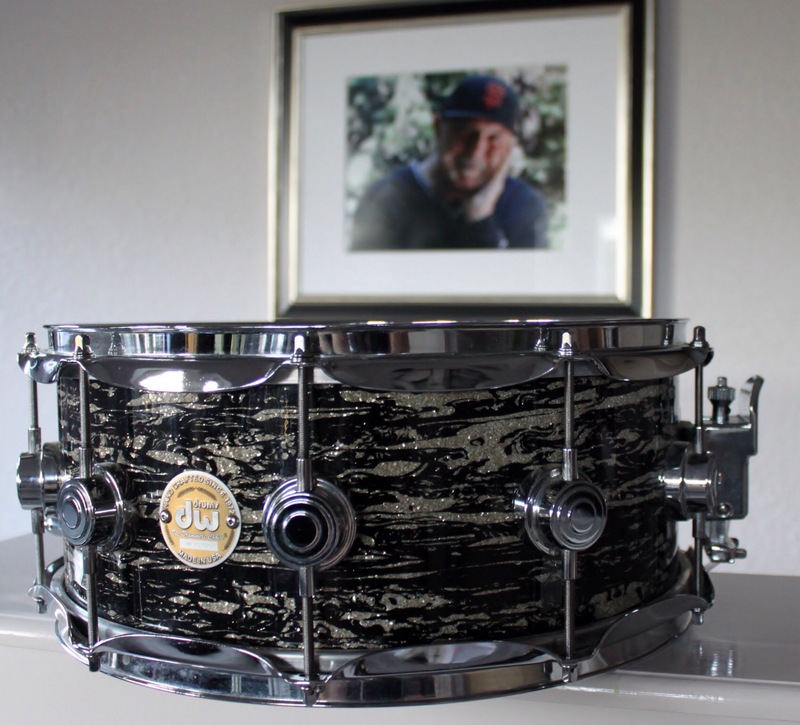 I was torn between Tom’s 1966 Ludwig Supraphonic snare and the snare from his DW kit with the black oyster glass wrap on the shells. The architect in me loved the purity of the Ludwig, but the drummer’s wife in me loved the DW snare because Tom played it so much. 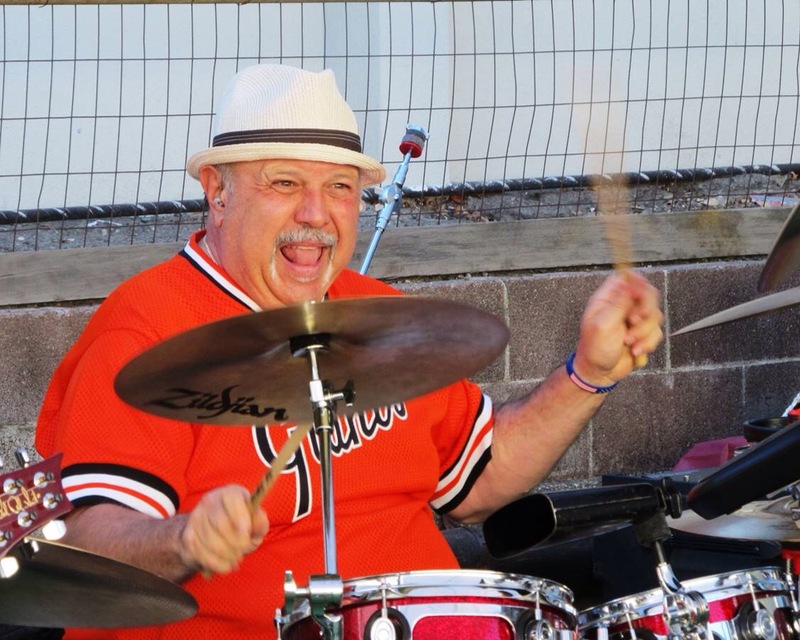 When I put my hand on the snare I can still feel Tom’s energy and joy of drumming. So in the end I chose the DW. 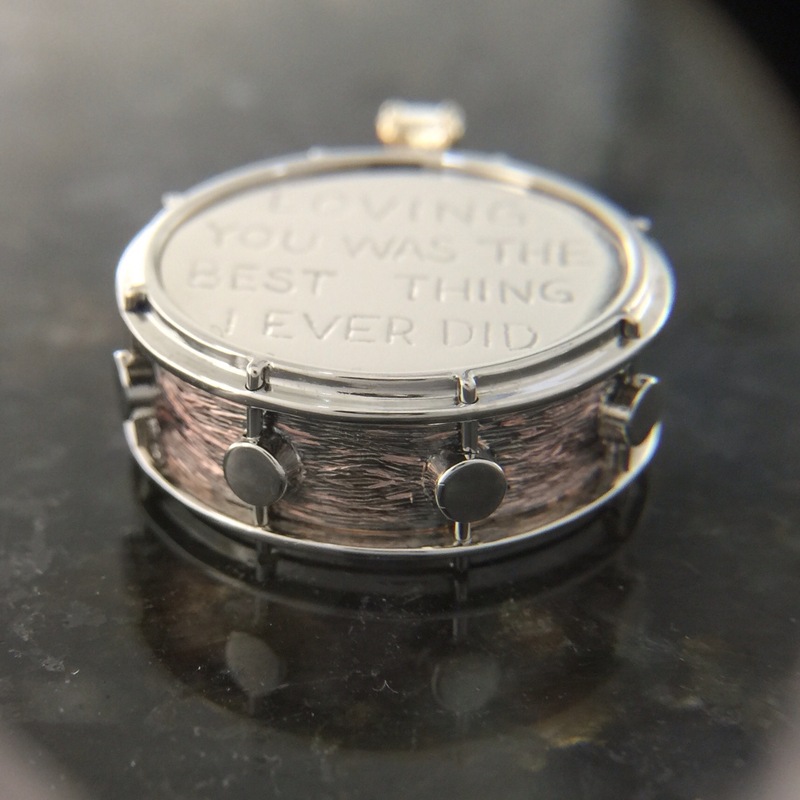 Mark, the jeweler, suggested several different ways to achieve the look of the snare, and ultimately we decided to go big and go for the detail. Throughout the entire process, he sent me photos and we worked together to make this special. The diamond on the bale is one of Tom’s earrings. 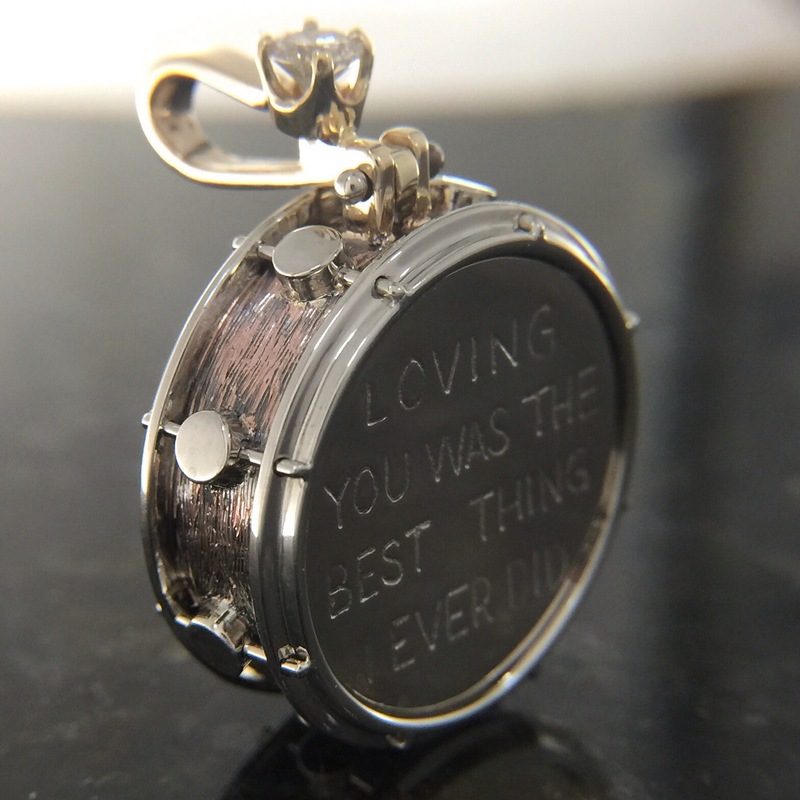 The inscription “loving you was the best thing I ever did” was something Tom would say to me often and is one of the last things he said to me. 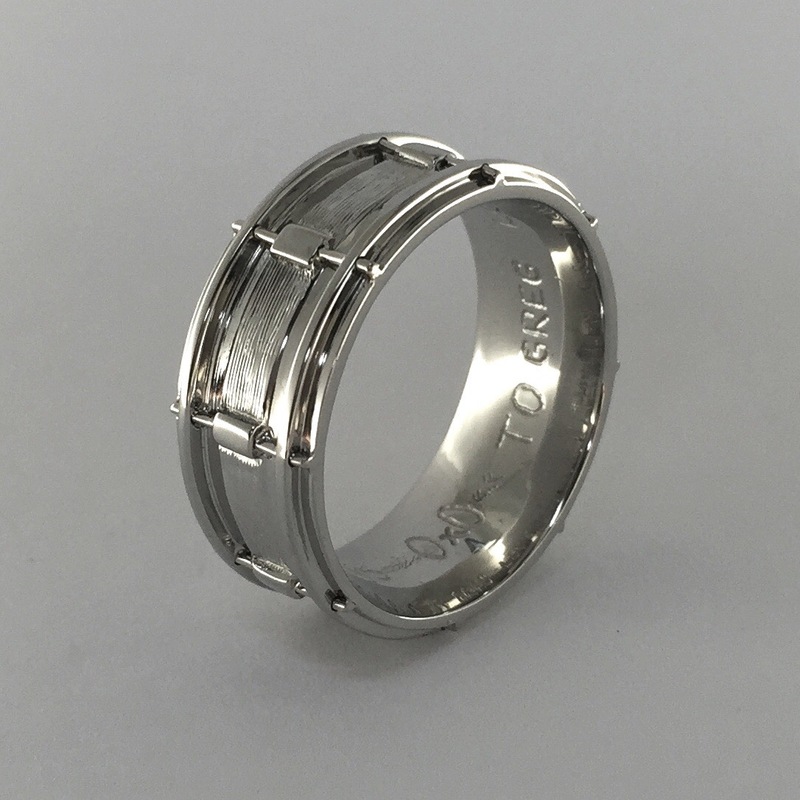 Special rims were milled in wax then cast in white gold. 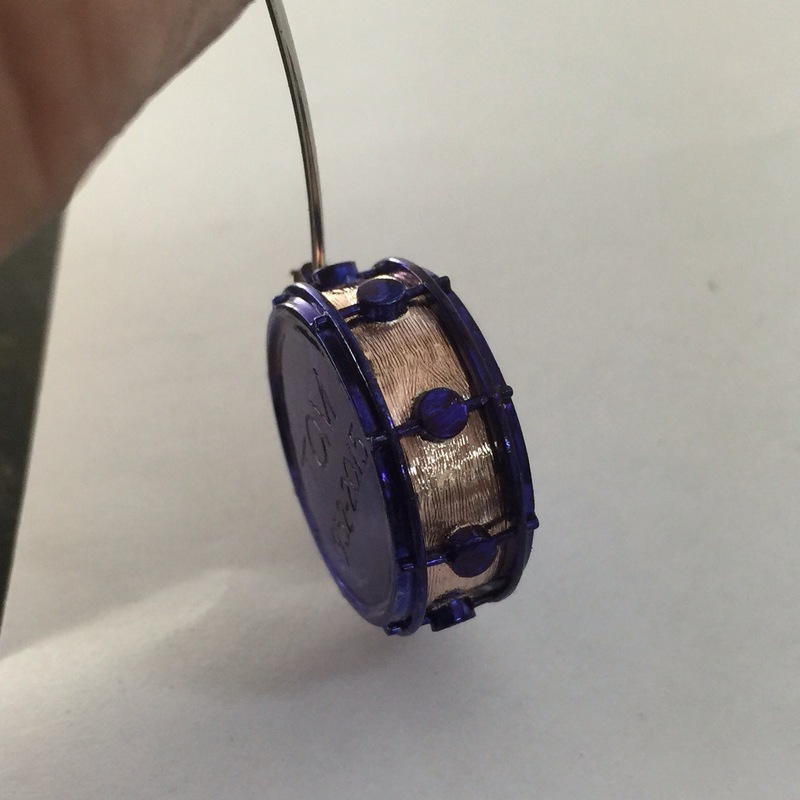 I hand frabracated the drum shell in rose gold with a rolling mill. 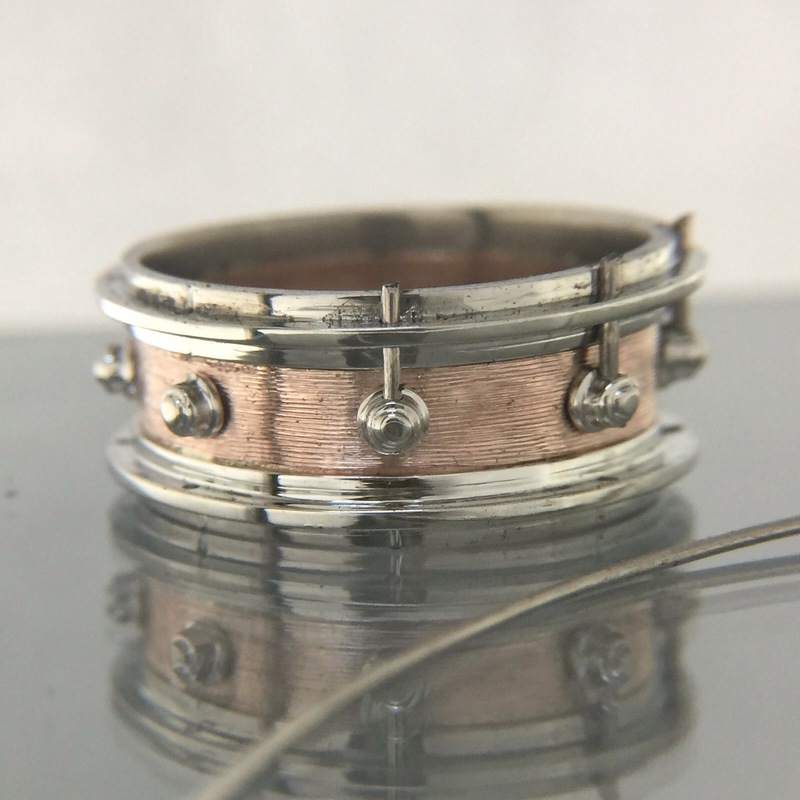 I cut up a rod of white gold and soldered them on the shell to form the lugs. I assembled the rims and put the base texture on the shell using a florentine graver. 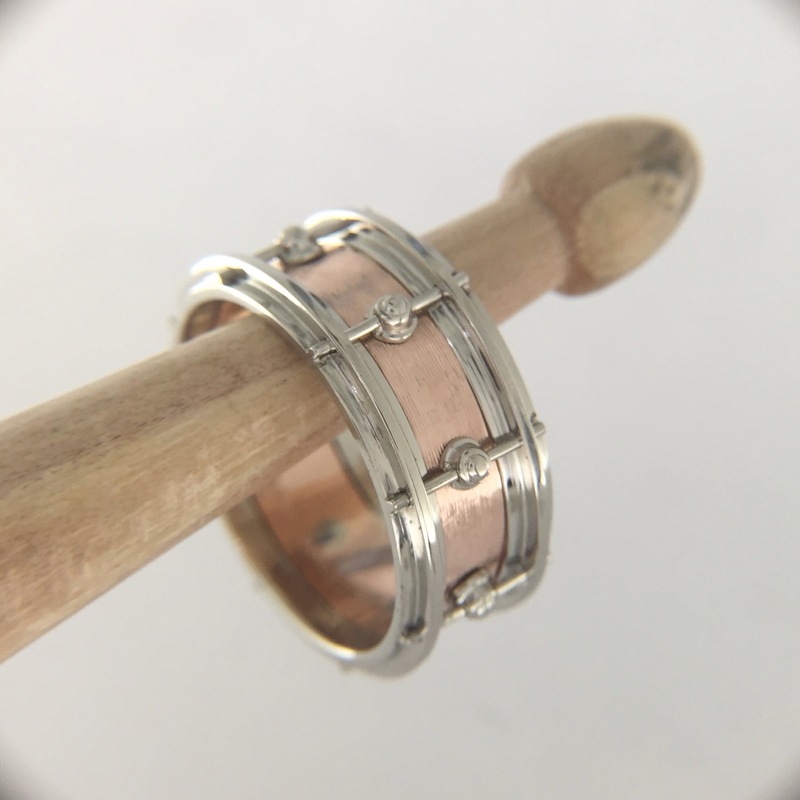 The rims were drilled to accept the tuning tension rods. The white gold wires were laser welded in place. Two round discs were formed from a sheet of gold. The discs were to become the drum heads. One was soldered on from the inside for a nice crisp look from the outside. Some of the ashes were placed in the drum and the other drum head was laser welded on, sealing the urn. 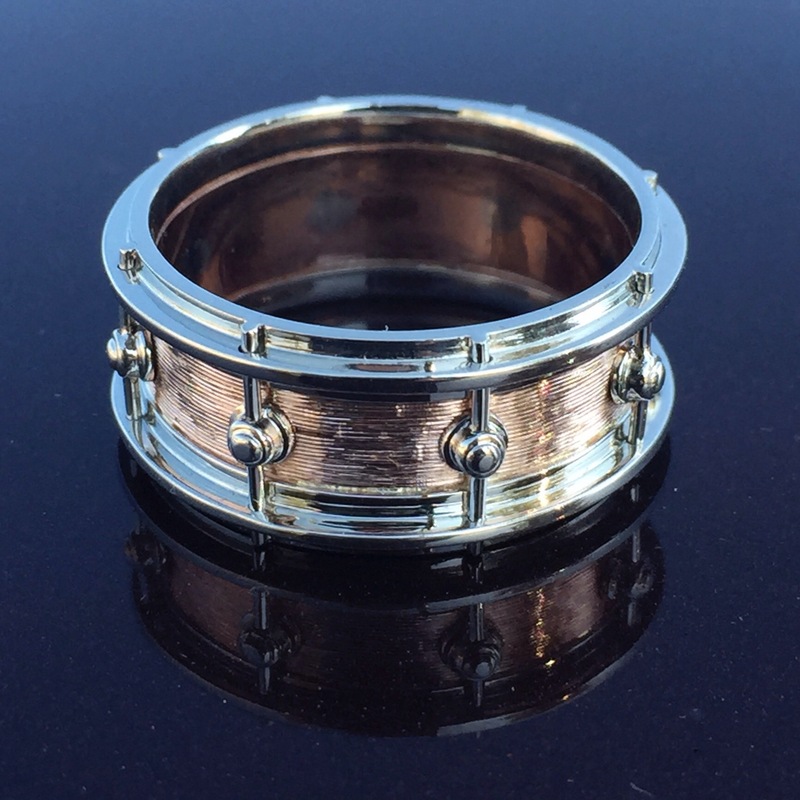 To attempt to emulate the finish of Tom’s snare, I black rhodium plated the shell. All the surfaces that I did not want plated, had to be carefully painted with a tiny brush. It was placed in the plating bath then the paint was removed. 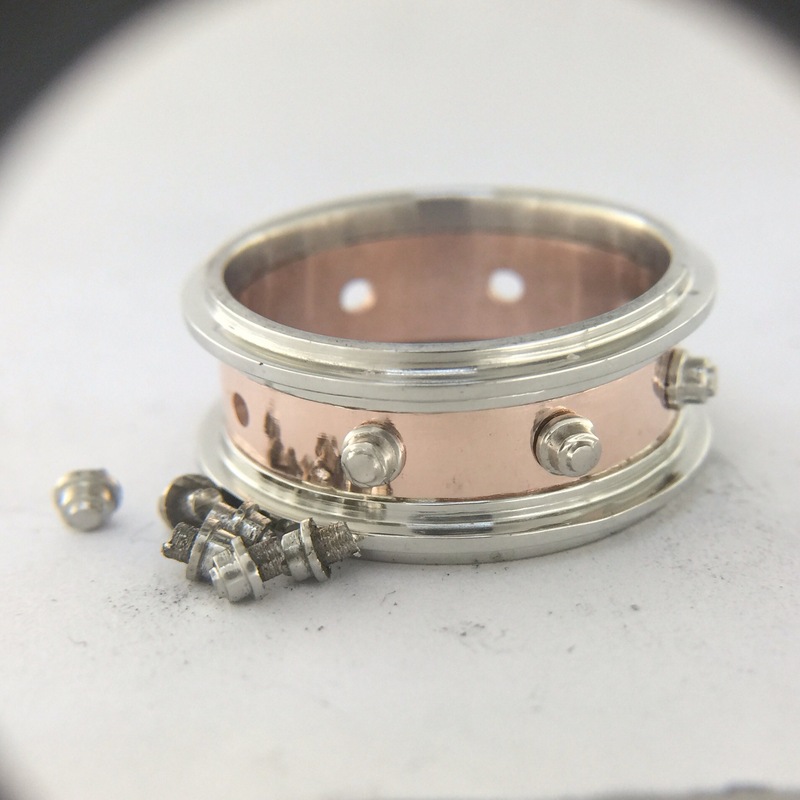 I went back over the shell with a graver again to reveal the rose gold in some places. 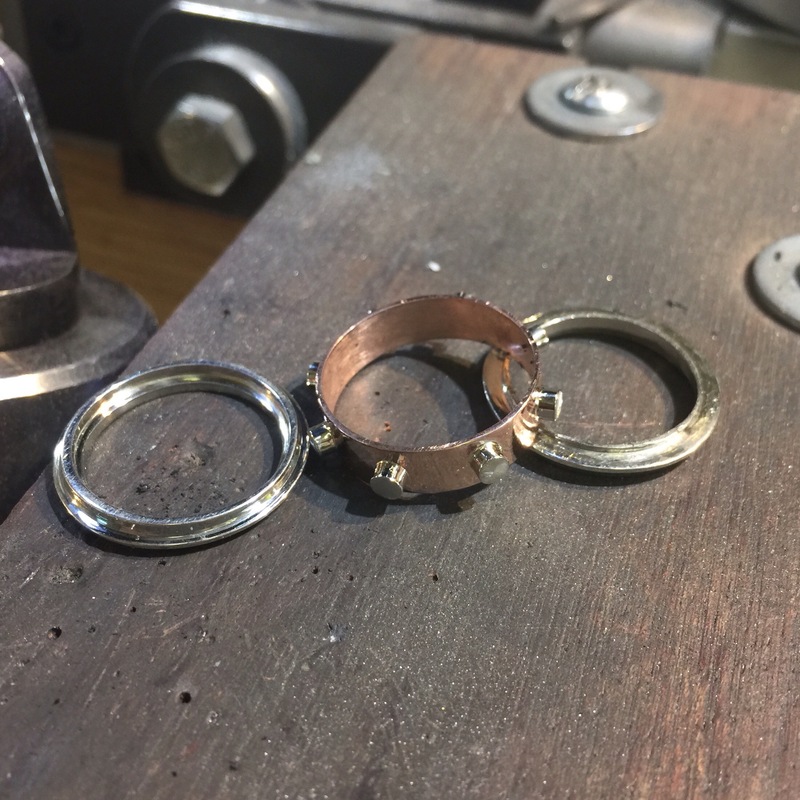 I hand frabracated a hinged bail using the diamond earring that Beth sent me and some gold from his wedding band. Seems that life is getting smaller and smaller. 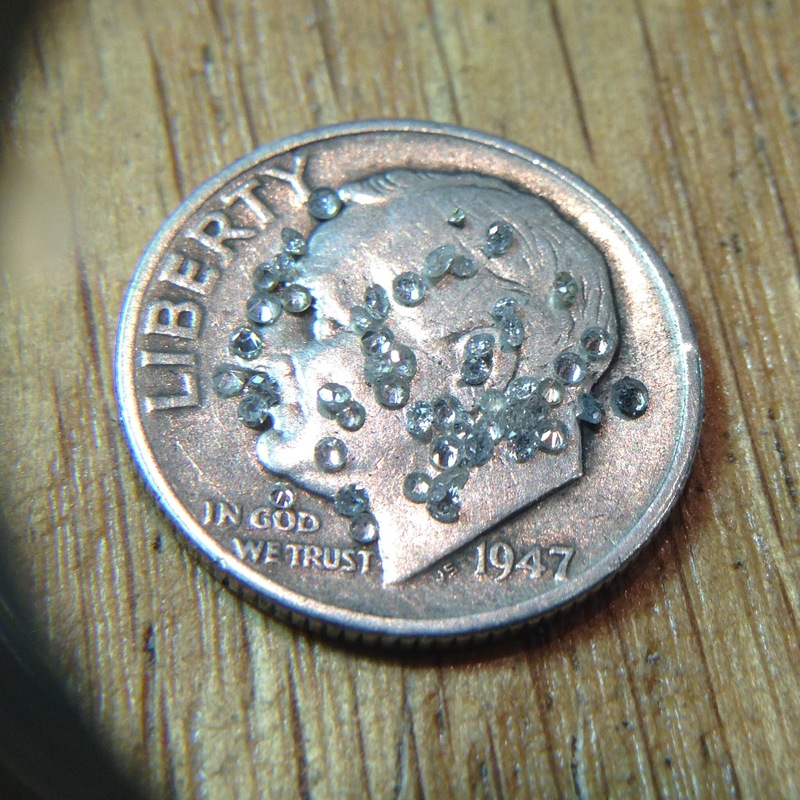 I bead set four .8-.9mm diamonds in each prong of this Tiffany peg head. 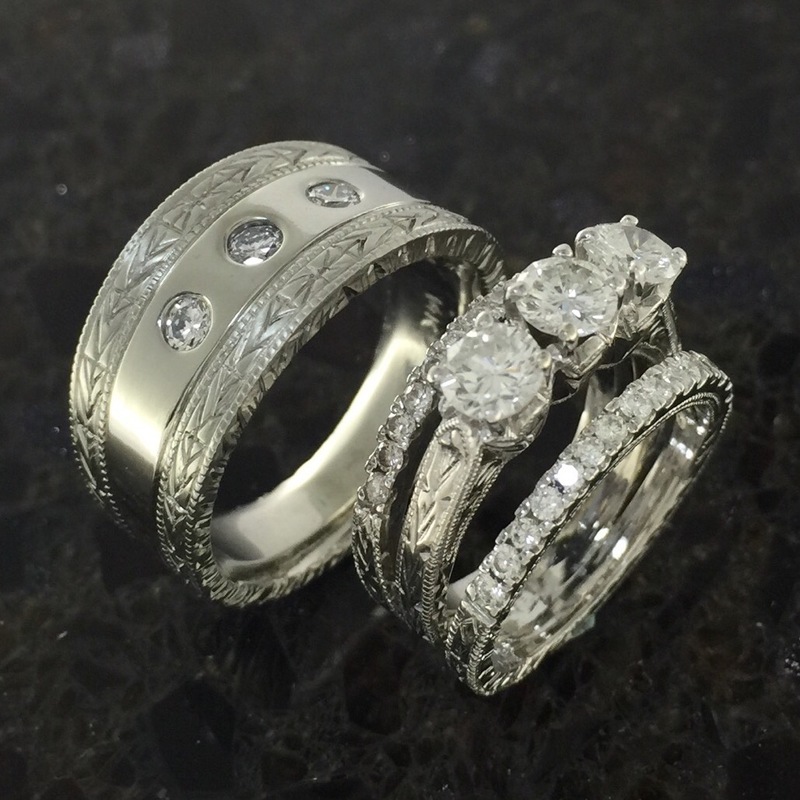 I was commissioned to make wedding bands for a beautiful hand engraved engagement ring. It seemed a shame to cover up the side engravings with the new bands. It was decided to solder them together at the shank but separate them at the top so you could still see the carving. 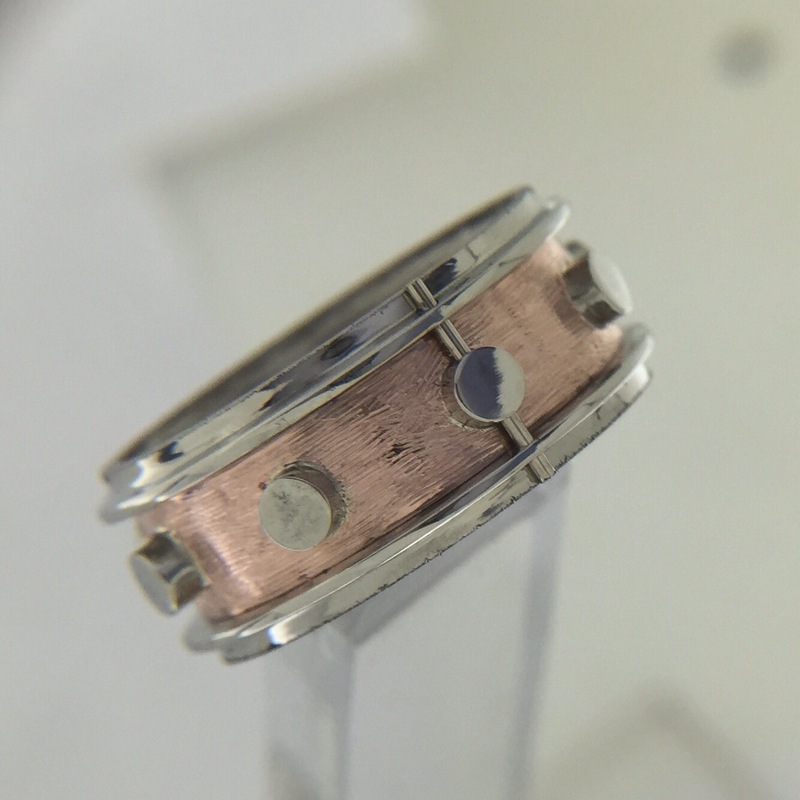 I made the two diamond bands and practiced matching the hand engraving style of the original ring on some scrap silver. 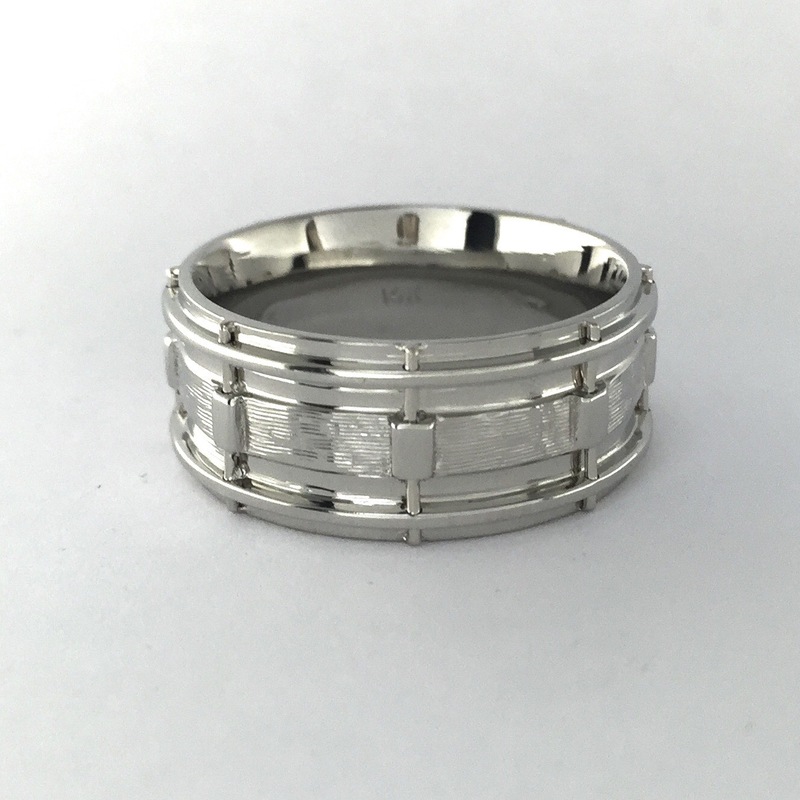 When the graving work was completed on the new white gold rings, they were all soldered together. 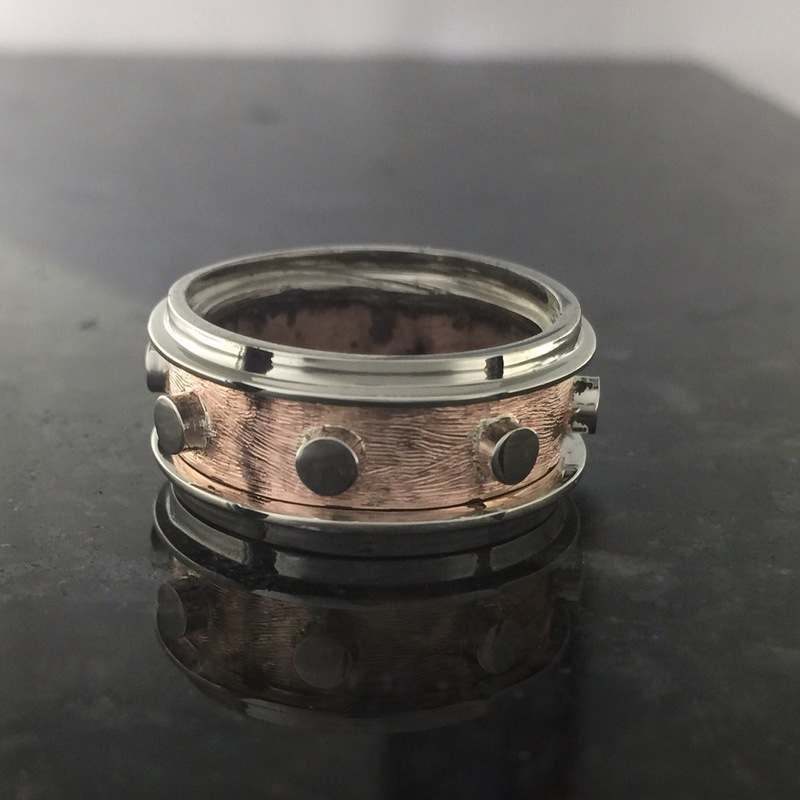 I also created a men’s wedding band that captured some of the same design motifs. 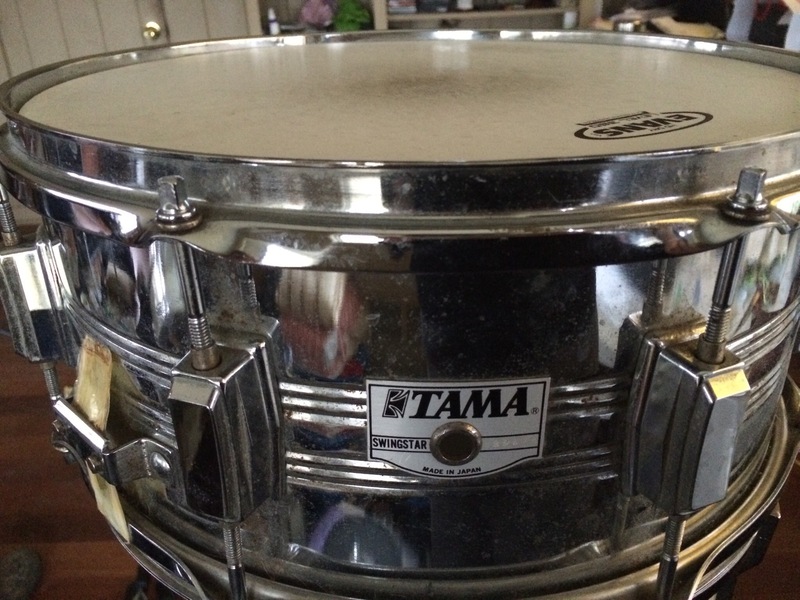 I was sent pictures of a classic Tama steel snare. 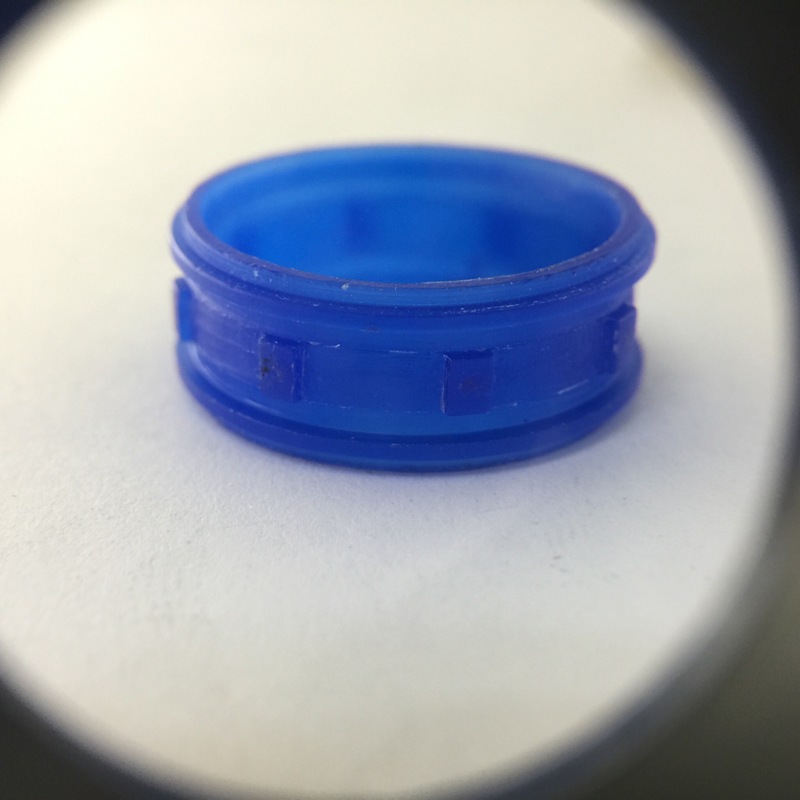 I carved this ring as a one piece wax with shell, rims and lugs combined. 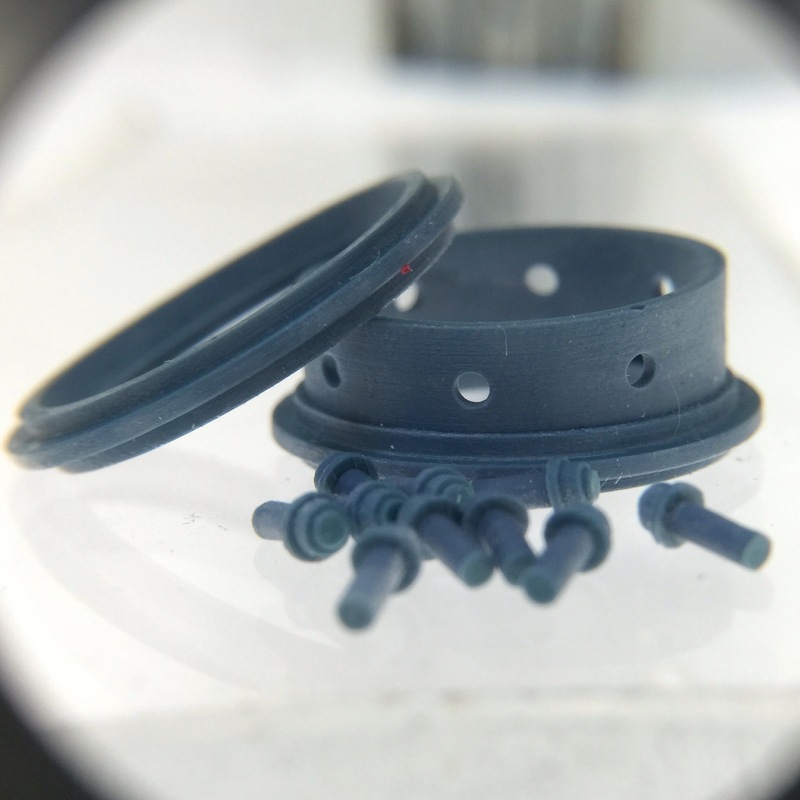 After casting, I laser welded the tension rods on. 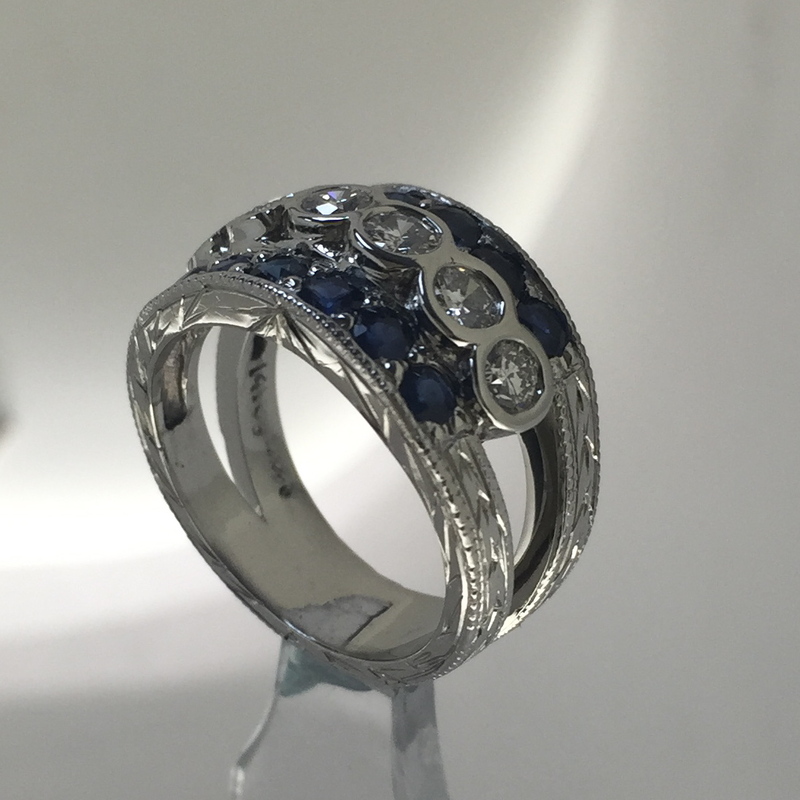 This customer wanted a vintage look with hand engraving for this remounting of her sapphires and diamonds. 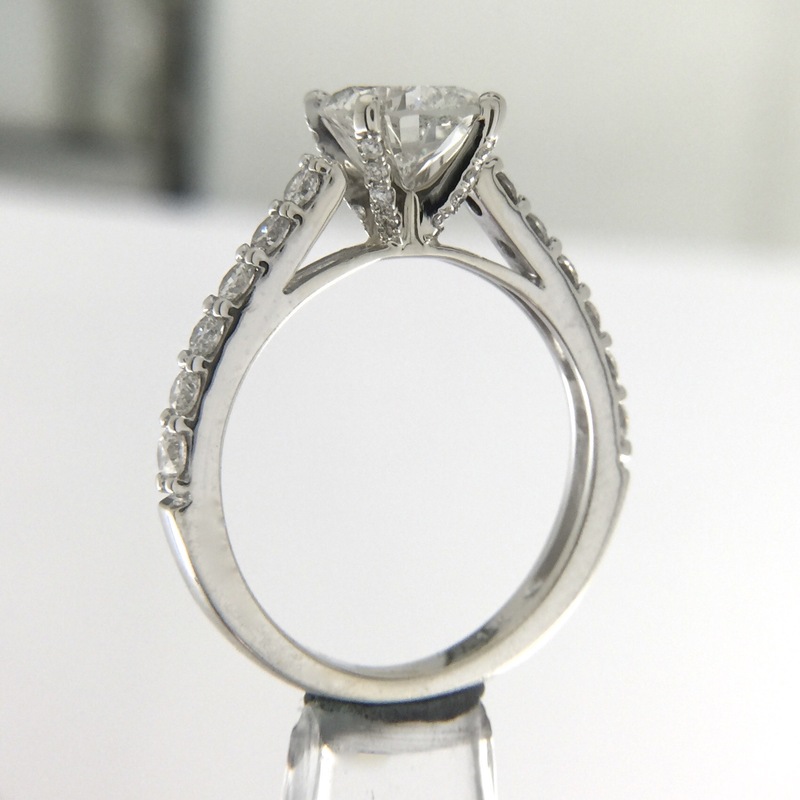 I love using stones with sentimental value in new designs. It can carry on memories and stories. I have really enjoyed learning hand engraving techniques. It has always fascinated me. I hope to continue to learn and explore this facet of jewelry making. 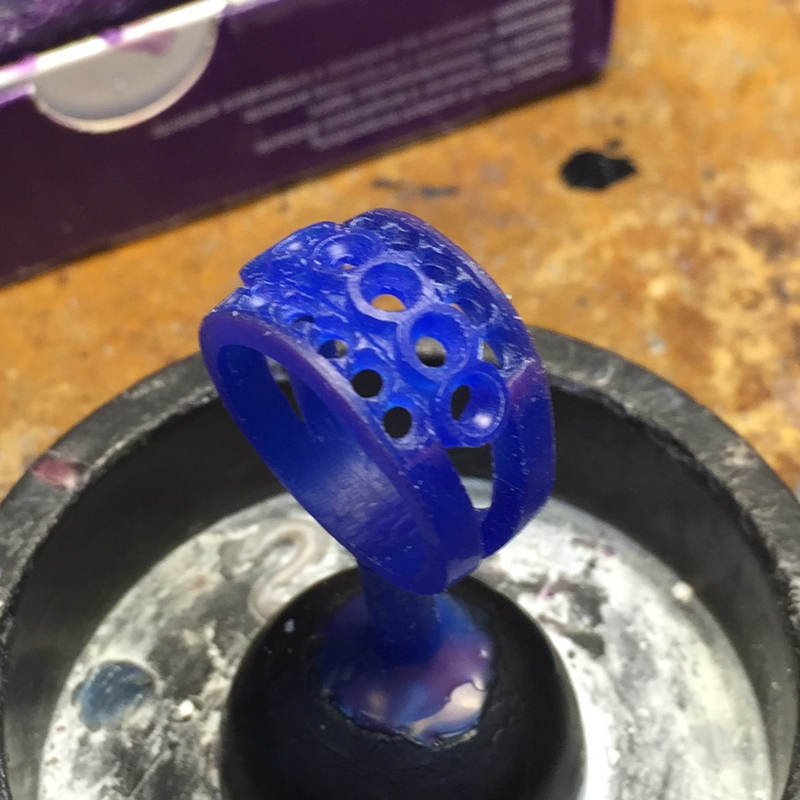 This ring was so much fun to make. Greville, in Australia, sent me pictures of his beautiful vintage, hollow body Gretsch guitar. I really got to play with trying to nail all the details of this classic guitar in such a small space. I knew that I wanted to get a good shine on the body of the guitar. But to do that, I would lose some of the crispiness and definition of the hardware in the buffing. I carved the body, noting all the proportions. 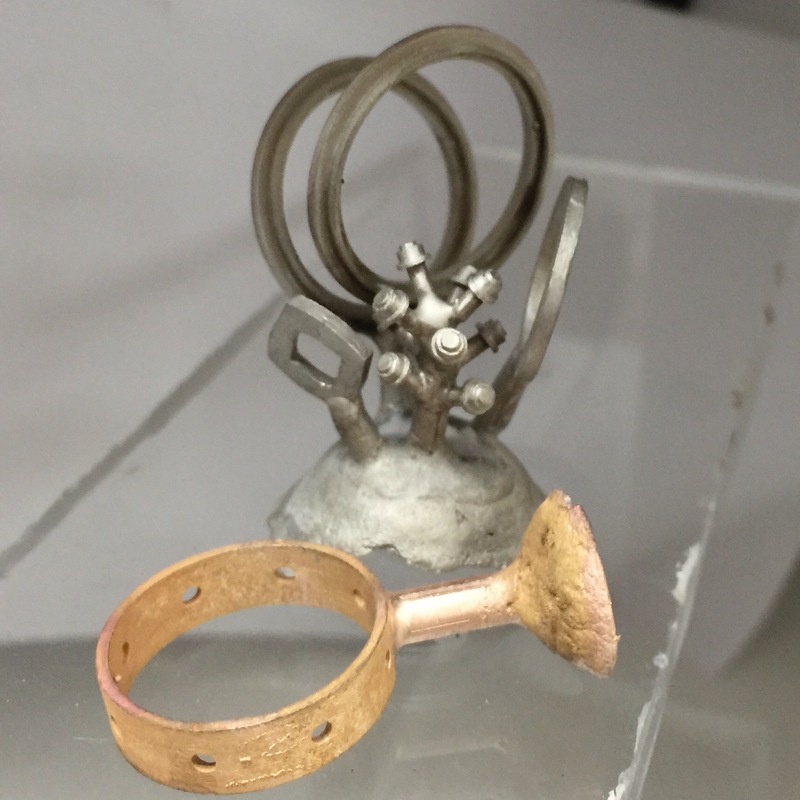 and I made some small hardware pieces in wax but ended up fabricating them directly in metal. It was worth carving them to see the placement of everything. Creative license allowed me to take the fret board square down the ring. 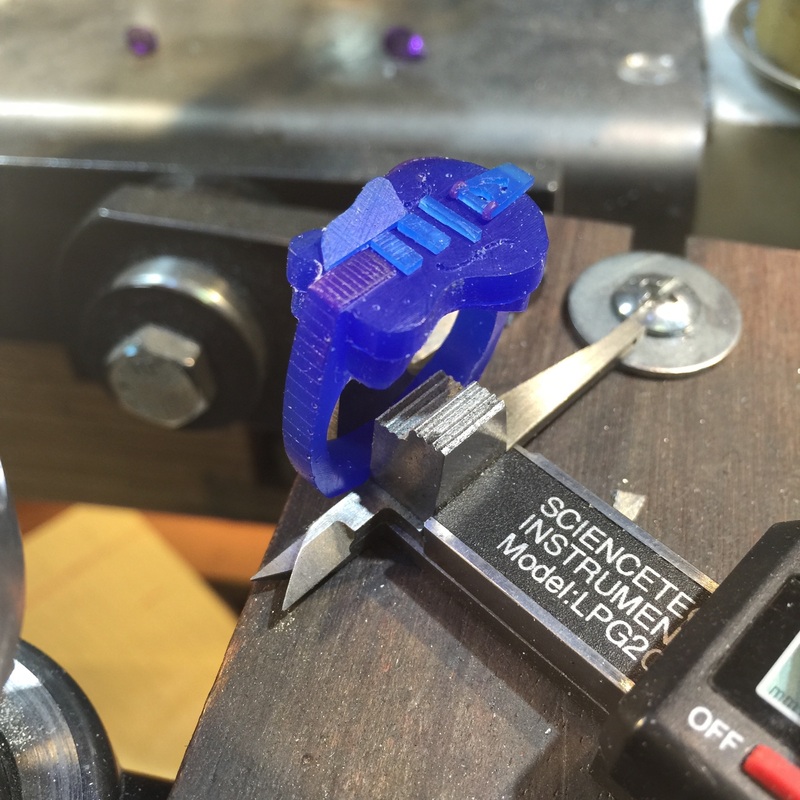 We ended up with a great squared shank and a very wearable ring. 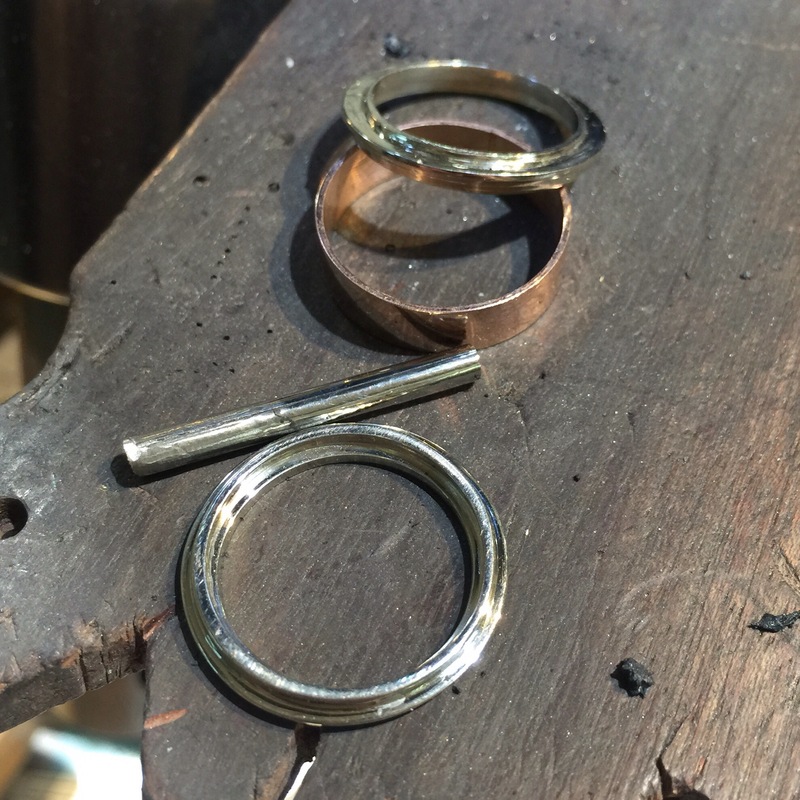 After casting the entire ring was burnished and beaten to work harden the surface. I sanded and polished the body in preparation for the hardware. In this picture, the hand fabricated pickups, bridge and Bigsby vibrato bar have been laser welded in place. You can see the naked head stock without the tuning knobs in place yet. In all, 17 parts were added to the main body. The fret board was cut in with a super thin saw blade and the fret markers were properly placed. 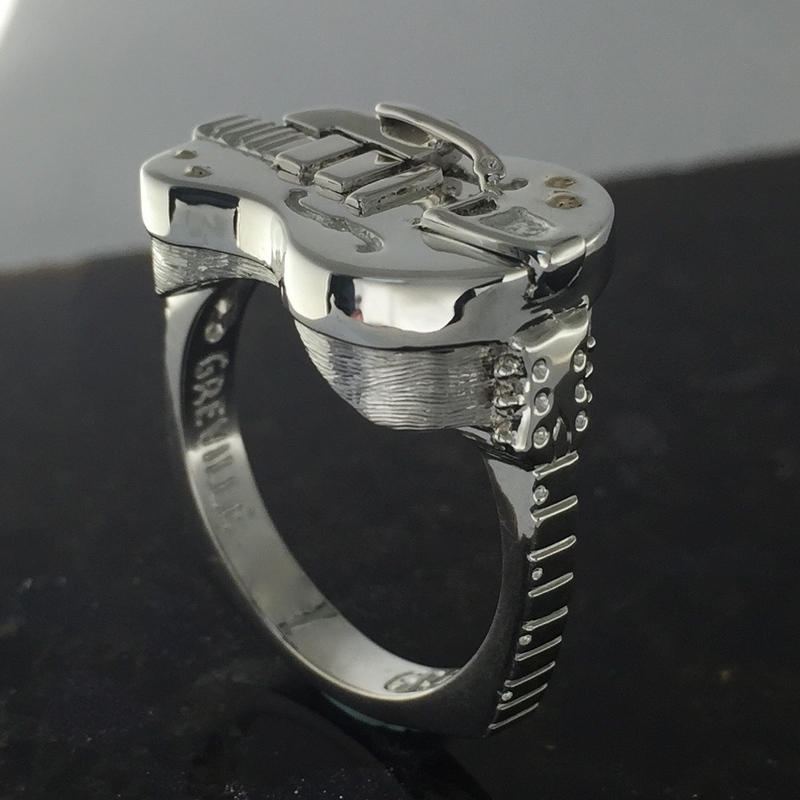 Lastly, I hand engraved inside the ring and florentine finished the area under the body. Thanks for sending me the picture of you with the ring, Greville!